My question is why $f$ satisfies an irreducible polynomial equation $(\phi^*a_n)f^n + ... +(\phi^*a_0)=0$? Why irreducible? 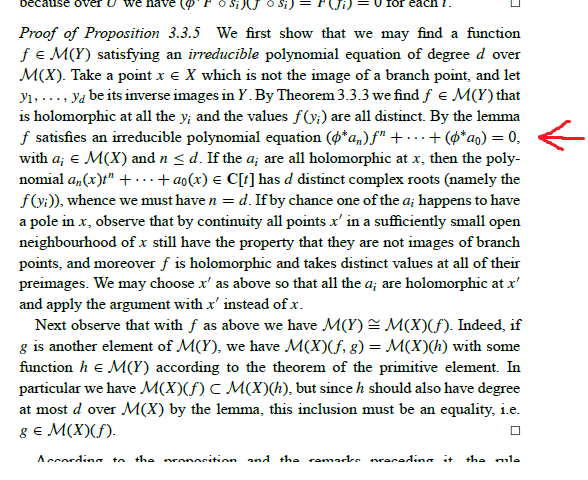 Lemma 3.3.6 says that the polynomial equation is not neccessary irreducible. Intuitively I guess that should have something to do with the assumption that all values $f(y_i)$ are distinct. Why does it suffice? I don't find a clear argument. I haven't looked into the whole question in detail, but this is just a general algebraic principle. 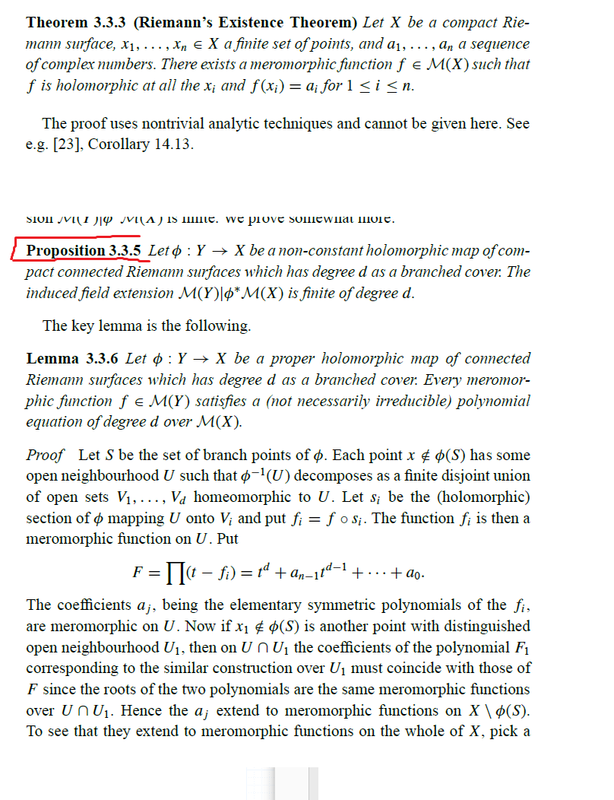 The Lemma tells you that there is some non-zero polynomial $P$ with coefficients in $M(Y)$ that kills $f$, i.e. satisfies $P(f) =0$. Now take such a non-ozero polynomial $P_0$ of smallest degree $n \leq d$. If $P_0$ were not irreducible, you could factor $P_0$ as $P_0 = RS$ for some non-zero polynoimals $R,S$, both of strictly smaller degree than $P_0$. But then $0=P_0(f) = R(f) S(f)$ implies that either $R(f) =0$ or $S(f) = 0$, contradicting minimiality of the degree. Not the answer you're looking for? Browse other questions tagged irreducible-polynomials riemann-surfaces complex-manifolds function-fields or ask your own question. Counting total number of monic irreducible polynomials of all degrees $k$ that divide $m$. Under what conditions do there exist non-constant meromorphic functions between general Riemann surfaces?